North Carolina Central was a football team looking for some respect. It got exactly that as the Eagles dominated North Carolina A&T, the top-ranked team among historically black colleges and universities (HBCUs), 42-21 for its first outright Mid-Eastern Athletic Conference (MEAC) football title and a berth in the 2nd Air Force Reserve Celebration Bowl on Dec. 17 in Atlanta. NCCU will face the Southwestern Athletic Conference champion at the Georgia Dome for the HBCU national championship. A jubilant overflow crowd of 15,715 at O’Kelly-Riddick Stadium and a national TV audience on ESPN3 watched senior quarterback Malcolm Bell steer the Eagles to victory. Bell ran for a career-high 131 yards, including scoring runs of 15 and 41 yards and passing for 184 yards (10 of 18) and another score in the proudest moments of his record-setting career. “We wanted an opportunity to have an outright championship and we finally worked hard enough to get one at the end of the year,” said NCCU head coach Jerry Mack, who has now beaten A&T (9-2, 7-1 MEAC) and claimed titles in his first three years, leading the Eagles (9-2, 8-0 MEAC). NCCU, who was ranked 20th in the FCS Coaches Poll, has won 15 straight MEAC games and boasts a 21-3 conference record during Mack’s tenure. North Carolina Central’s Ramone Simpson carries the ball during the first quarter of an NCAA football game against North Carolina A&T on Nov. 19 at O’Kelly-Riddick Stadium in Durham, North Carolina. “We knew going into the game that Malcolm would have an opportunity to do some great things and he did it with his arm and his legs,” Mack said. In two previous season-ending wins against A&T (21-14 in 2014 and 21-16 in 2015), the Eagles earned a share of the conference title with the Aggies. Last year, despite beating them in the regular season’s final game, NCCU watched as A&T played before a national TV audience in the first Celebration Bowl. That snub was a motivating factor for the Eagles all year. After the stunning win, Eagles students and fans rushed onto the field. NCCU sophomore running back Dorrel McClain added 109 rushing yards and three scores. McClain opened the scoring on a 15-yard run early in the second quarter and finished the Aggies off with a backbreaking 76-yard scoring jaunt midway through the fourth quarter. The Eagles amassed 270 rushing yards against the fifth-best rushing defense in FCS football that was giving up just 76.8 yards on the ground. The game really turned on A&T’s inability to generate any offense. Playing without injured starting quarterback Lamar Raynard, A&T had to turn to third-stringer Oluwafemi Bamiro and later to fourth-stringer Isaiah Hicklin. Both signal-callers struggled to move the ball. Dynamic senior running back Tarik Cohen, the league’s season and career rushing leader, was bottled up all day running for just 82 yards on 23 carries, including a meaningless two-yard touchdown run in the game’s final seconds. Cohen had just 35 yards through three quarters on 15 carries. 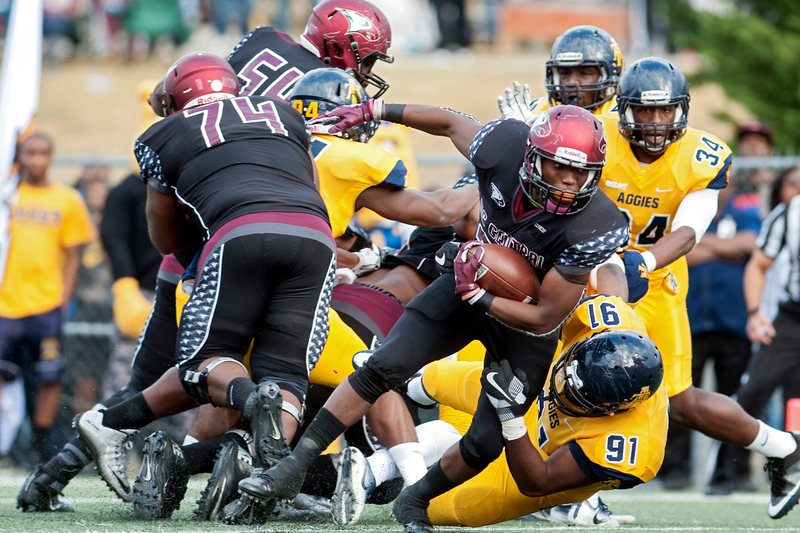 NCCU finished with 454 yards of offense to 328 for A&T, but it wasn’t that close. Senior linebacker LeGrande Harley led the NCCU defense with 10 tackles. The Eagles led 14-0 at the half after limiting the Aggies to just 100 total yards. The lead swelled to 21-0 early in the third quarter after an Eagles interception by safety Jaquell Taylor. Three plays later, Khalil Stinson made a spectacular one-handed touchdown grab of Bell’s pass, then the PAT to put the Eagles up 21-0. A&T, who came in ranked ninth in the latest FCS national poll, finally scored on its next possession as Bamiro hit receiver Elijah Bell over the middle and the freshman ran away from defenders to score from 86 yards out. 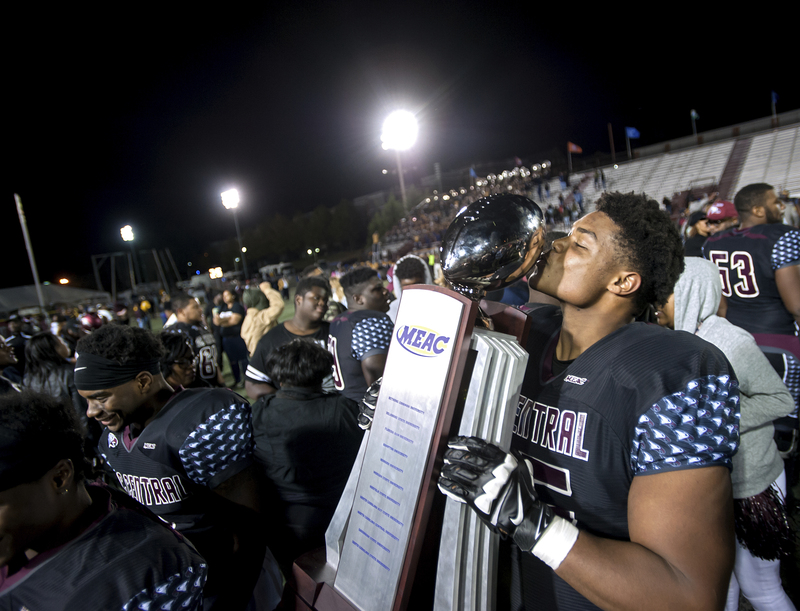 North Carolina Central’s Nick Leverett kisses the conference championship trophy after the team’s NCAA college football game against North Carolina A&T on Saturday, Nov. 19, 2016, in Durham, N.C.
Before the Aggies could capitalize on the score, Bamiro was picked off again by safety Mike Jones at the A&T 41. Four plays later on a quarterback draw, Bell went 25 yards to score. The PAT put NCCU up 28-7 with 5:51 left in the third period. The teams exchanged early fourth-quarter scores. McClain finished off a drive on a one-yard run with 13:55 to play. Hicklin and Bamiro then teamed up to engineer a nine-play, 79-yard drive that culminated in a 15-yard pass. On the first play following the kickoff, McClain set sail on his 76-yarder. A&T’s 9-2 record and high national ranking earned them an at-large berth in the 24-team FCS playoff field that was announced Sunday. The Aggies will play at the University of Richmond in Virginia on Nov. 26 in the first round of the playoffs.